The Citation III, a midsize cabin business jet with a 2,054 nm range, was the first of Cessna’s model 650 series. It was designed for optimal speed, utilized light weight composites and smooth surfaces to cut down on drag, and featured an entirely new fuselage mated to a super-critical swept back wing and a T-Tail. As of May 2018, 100% of the Citation III aircraft were purchased pre-owned by their current owners. 21.2% are for sale with more than half of those (64%) under an exclusive broker agreement. When for sale, the average time on the market is 493 days. Over the past 12 months, the Citation III has averaged 3 full retail transactions per month. Cessna set out to build a private jet with impressive range and speed while keeping costs low and performance high, and thus the Citation III was created. The new model symbolized several milestones in the Citation program – it was Cessna’s entry into the high speed, medium corporate jet market, their first model to utilize Garrett (now Honeywell) and not P&W engines, and was a departure from the original structural design of all previous models. At the time of release the Citation III had the longest range and the fastest overall cruise speed of any midsized jet. The Gulfstream G550 is a large-cabin, ultra long-range business jet traveling at ranges in excess of 6,700 nm. It features up to four distinct living areas, three temperature zones, and a choice of 12 floor-plan configurations with seating for up to 19 passengers. The G550 is equipped with the Gulfstream PlaneView cockpit, based on the Honeywell Primus Epic architecture and display system. The PlaneView cockpit presents critical flight information on 14-inch (36 cm) liquid crystal displays arranged for easy interpretation. The latest in Head-Up Display technology integrated with the next-generation Gulfstream Enhanced Vision System (EVS) II. The aircraft is also equipped with commercial and military communications equipment to provide secure voice and data capability. As of May 2018, 64% of the Gulfstream G550 aircraft were purchased new by their current owners, the other 36% pre-owned. 4.3% are for sale with the majority of those (79%) under an exclusive broker agreement. When for sale, the average time on the market is 133 days. Over the past 12 months, the Gulfstream G550 has averaged 7 full retail sale transactions per month. 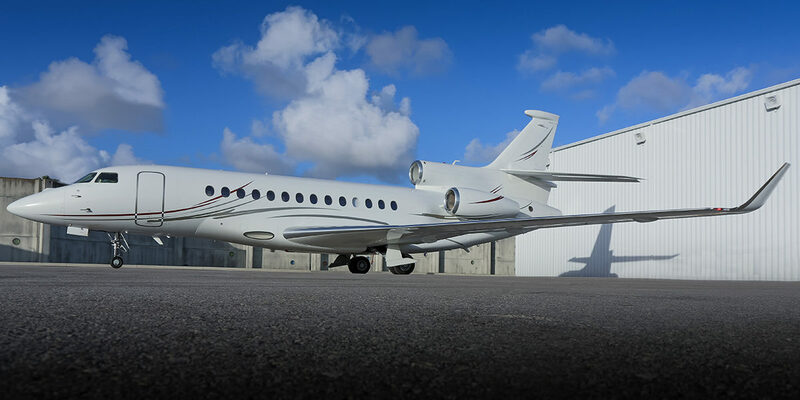 The G550 traces its roots to the Gulfstream GV which was the first ultra-long-range large-cabin business jet produced, which began delivering to customers in 1995. Most notable about the G550 is its 6,708 nm range, made possible in part by the Rolls Royce engines powering it. Gulfstream acquired G550 Type Certification in August 2003. In 2003 the National Aeronautic Association (NAA) awarded its prestigious Collier Trophy to the Gulfstream G550 team for technological and safety advances. A total of 581 Gulfstream G550 aircraft have been manufactured with 552 in operation worldwide. The Challenger 605 was introduced as an upgrade to the Challenger 604. With the success of the Challenger line, Bombardier continues to use the general design while offering updated technology and improvements. The 605 offers larger and higher positioned windows, an upgraded galley, a revamped cabin and cockpit, and upgraded avionics, along with an increased payload. As of September 2017, 42% of the Challenger 605 aircraft were purchased pre-owned by their current owners, the other 58% new. 6.3% are for sale with the majority of those (89%) under an exclusive broker agreement. When for sale, the average time on the market is 251 days. Bombardier introduced its Challenger 604 in 1995 as a major upgrade on the Challenger 601 design that incorporated more powerful engines, larger fuel supply, a completely new undercarriage, structural improvements to its wings and tail and a new avionics system. Ten years later the Challenger 605 was introduced with upgrades to the 604 design. Production ended in 2016 with a total of 290 Challenger 605 aircraft manufactured. There are 287 Challenger 605 aircraft in operation today. Most of these are wholly owned (281) with 3 in shared and 3 in fractional ownership. 9.4% are currently leased. North America has the largest percentage of wholly owned Challenger 605 aircraft (58%), followed by Asia (21%), and Europe (17%). The Global 5000 is an ultra-long range, wide-body business jet with the advantage of having short takeoff and landing performance. The cabin is divided into three zones with optional rear stateroom, and features a large galley, forward and aft lavatories, and a generously sized baggage compartment. Overall it offers comfort, flexibility, and innovation. As of September 2017, 70% of the Global 5000 aircraft were purchased new by their current owners, the other 30% pre-owned. 8.3% are for sale with the majority of those (89%) under an exclusive broker agreement. When for sale, the average time on the market is 489 days. The Global 5000 is a slightly smaller and faster derivative of the Global Express, which was the second ultra long-range large-cabin business jet produced and started delivering to customers in 1997. The Global 5000 made its maiden flight in March 2003 with FAA and JAA type certification awarded in October 2004. In 2008 Bombardier announced an increased certified gross weight, which permitted increased fuel load and an increased projected maximum range. A total of 221 Global 5000 aircraft have been manufactured with 218 in operation worldwide. There are 218 Global 5000 aircraft in operation today. Most of these are wholly owned (204) with 1 in shared and 13 in fractional ownership. 13% are currently leased. North America has the largest percentage of Global 5000 aircraft (43%), followed by Europe (29%), and Asia (25%). The Gulfstream GIV is an updated version of the Gulfstream GIII. It was given a 54-inch cabin stretch (allowing for a 6th window on each side), upgraded engines that are more powerful and fuel efficient than their predecessors, and an aerodynamically and structurally improved wing which allows for additional fuel capacity. Upgraded avionics made it the first business jet to have an entire glass cockpit with an advanced EFIS avionics suite and six color CRT displays. Design work on the GIV began in early 1983 and the first flight took place on September 19, 1985. The GIV entered into service in 1987 after receiving FAA certification on April 22 of that year. A total of 196 GIV aircraft were manufactured with 179 currently in operation worldwide. It was upgraded to the special purpose GIV-SP version in 1993 and was later re-designated the G400. There are 179 Gulfstream GIV aircraft in operation today. Most of these are wholly owned (175) with three in shared and one in fractional ownership. 11% are currently leased. North America has the largest percentage of wholly owned Gulfstream GIV aircraft (86%) followed by Asia (7%). The Falcon 7X is a fly-by-wire ultra-long range business jet which flies further and faster than any of its Falcon predecessors. It features a completely new wing design including winglets, which makes the longer range possible. As of September 2017, 27% of the Falcon 7X aircraft were purchased pre-owned by their current owners, the other 73% new. 7.7% are for sale with the majority of those (67%) under an exclusive broker agreement. When for sale, the average time on the market is 284 days. The Dassault Falcon 7X was first presented to the public at the 2001 Paris Air Show and first flew in May 2005. The type certificate was received in April 2007 from the FAA and EASA and it entered service in June. There are 271 Falcon 7X aircraft in operation today. Most of these are wholly owned (267) with 4 in shared ownership. 9.2% are currently leased. Europe has the largest percentage of wholly owned Falcon 7X aircraft (43%), followed by North America (31%) and Asia (16%). The Global 6000 is the fourth and latest business jet aircraft model built by Bombardier to compete in the new ultra-long range large-cabin market. The Global 6000 has a large spacious cabin in excess of 2,000 cubic feet and can travel non-stop over 6,100 nm. The ultra-long range market is defined as a new group of large cabin business jets that can fly 6,000 nm or greater distance. As of July 2017, 91% of the Global 6000 aircraft were purchased new by their current owners, the other 9% pre-owned. 4.7% are for sale with the majority of those (73%) under an exclusive broker agreement. When for sale, the average time on the market is 236 days. The Global 6000, which started delivering to customers in 2012, traces its roots to the Global Express XRS, which was the third ultra long-range large-cabin business jet, produced. A total of 280 Global 6000 aircraft have been manufactured with 241 in operation, 5 in production, and 24 at the manufacturer. Two new aircraft will follow the Global 6000. They are the Global 7000 and Global 8000 ultra-long-range large cabin business jets. There are 241 Global 6000 aircraft in operation today. Most of these are wholly owned (220) with 2 in shared and 19 in fractional ownership. 8% are currently leased. North America has the largest percentage of wholly owned Global 6000 aircraft (36%), followed by Europe (40%), and Asia (18%).